Bradford senior Larkin Painter committed Friday to play football for Heidelberg University, an NCAA Division III program in Tiffin, Ohio. (Front L-R) Sara Painter (mother), Larkin Painter, Izabella Painter (sister). (Back L-R) Jerame Painter (father), John Cruse (former Bradford head football coach). 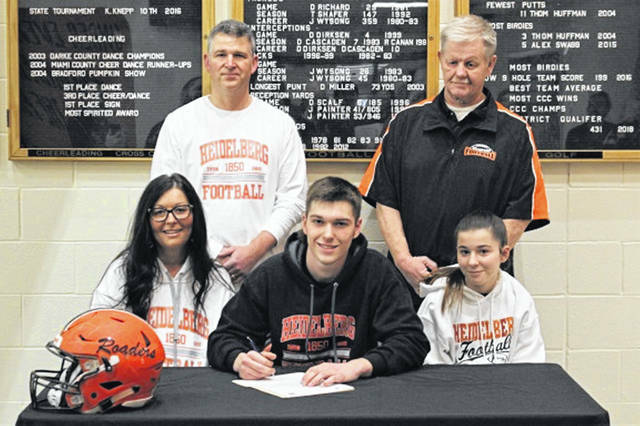 BRADFORD – Bradford senior Larkin Painter committed to play football for Heidelberg University. Painter, the son of Sara and Jerame Painter is realizing an opportunity to play football at the college level, a dream he has had since his peewee football days. He committed to Heidelberg Friday afternoon before family, coaches and friends at Bradford High School. Painter expects to play wide receiver or tight end for Heidelberg, which went 5-5 this past season. The Student Princes finished 4-5 in conference standings in the Ohio Athletic Conference, a NCAA Division III conference that also includes teams from Baldwin Wallace, Capital, John Carroll, Marietta, Mount Union, Muskingum, Ohio Northern, Otterbein and Wilmington. Coach Hawk believes Painter can make an impact on the Heidelberg football team. Painter plans to study Criminal Justice with hopes of one day working for the FBI.